Improving governance at the local level through increased transparency, voice and better service delivery was the objective of a joint project between the Centre for Democratic Transition (CDT), a national NGO based in Podgorica, Montenegro, and the Kotor municipality, Montenegro. 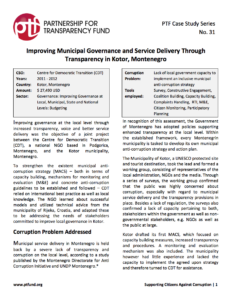 To strengthen the existent municipal anticorruption strategy (MACS) – both in terms of capacity building, mechanisms for monitoring and evaluation (M&E) and concrete anti-corruption guidelines to be established and followed – CDT relied on international best practice as well as local knowledge. The NGO learned about successful models and utilized technical advice from the municipality of Rijeka, Croatia, and adapted these to be addressing the needs of stakeholders committed to improve local governance in Kotor.